Categories are managed from Catalog Categories. Category Status: MUST be "ON" for category to appear in your store. Category status allows you to disable the category from being showed on your site without having to delete it. Parent Category: Here you can set the category you are currently adding to be a subcategory of another. If No parent selected the category you want to create is a top level category. Category Name: this is link you want to appear in the Categories block. In your store's back end, open the details of the category to which you want to add an image. On the WYSIWYG HTML-Editor panel at the top of the Description field, click the Resource Library button. note: This uses the HTML-Editor so you can add HTML, images and FLASH content. Meta Tag Keywords: is supposed to be a brief and concise list of the most important themes of your page. Meta Tag Keywords are used by search engines to describe the content of your web site. Stores: If you use multiple stores, select the stores for this category to appear. Sort Order: Sort Order set's the order of which the category will be displayed amongst others in the same parent category. 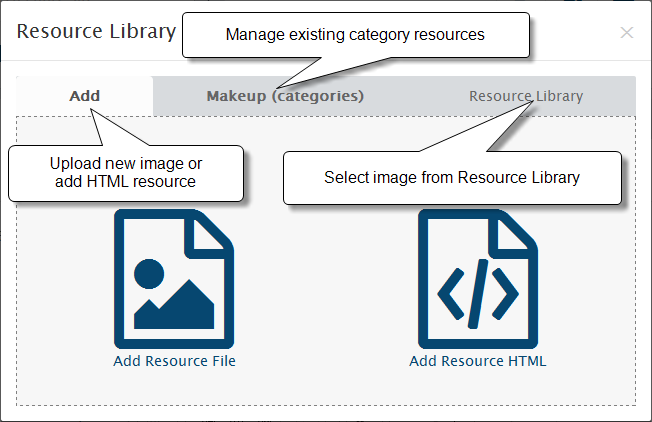 Image: in order to set an image for your category simply click on the "Plus image" and a Resource Library popup will appear allowing you to upload a picture you like from your local computer or set a pre-existing one which is already uploaded in the images resource library of WebriQshops.